The established political class just can’t accept the AAP style of politics. The systematic building of mohalla clinics, linking these clinics to hospitals, the revamping of government schools, a host of measures for the poor, including free and cheap potable water, subsidised electricity, more systematic mosquito eradication, anti-drug campaigns and a host of other measures. Despite this gambit, the AAP came to power with 67 Assembly seats out of 70 - with the BJP getting only three seats and the Congress none. This, the Opposition found horrible. Triangular politics became even more vicious and outlandish. The established political class’s dictum became "when in doubt attack the AAP". This vitriol was poured against the AAP because in the Lok Sabha elections in 2014 in Varanasi, where Narendra Modi was the candidate, the AAP came second and the Congress a poor third. The AAP had become a threat to the political establishment. After this, the anti-AAP campaign became a torrent of abuse, slander, administrative intervention and even extra-judicial attacks on the AAP. 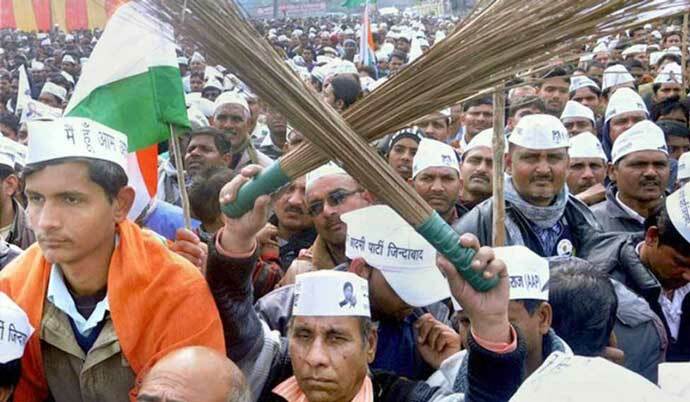 Arvind Kejriwal was pilloried for staging a dharna near the Republic Day parade. Didn’t Mahatma Gandhi stop the collection of precious salt at the end of the Dandi March? Didn’t he intervene, or near, into a host of events in South Africa and India? Did anyone, excluding the Sangh Parivar, claim that what he was doing was anti-national? And did Kejriwal actually disrupt Republic Day celebrations? Clearly, Kejriwal’s stated intention was to demonstrate without disruption. But the mass of the media never forgave him. In the past few days, on an “attack” channel, I heard the participants, including the anchor, referring to Kejriwal as a “Maovadi” and a "Talibani". My objections were heeded in the first case, but ignored in the second. Tragically, the media believes that anything goes, if it suits the interests of the channel, its owners and supporters. Thus, the term “fake” news. The role of the police cannot be understated. After the confusion and altercation with the chief secretary and the IAS Association, the Delhi Police searched Kejriwal’s residence. Could it have done so in the case of a Union minister? The CM is the head of the Delhi government. Unfortunately, this has become commonplace. For example, after a political debate in JNU in February 2016, three students, including Kanhaiya Kumar, Umar Khalid and Anirban Bhattacharya were arrested and accused of treason. The courts threw the case out. But even after two years, the chargesheet against these students has not been submitted. Or when months later, Kanhaiya was beaten up by lawyers in the presence of the police, police commissioner BS Bassi denied any violence. But the doctors of Ram Manohar Lohia Hospital found injuries on Kanhaiya’s body.